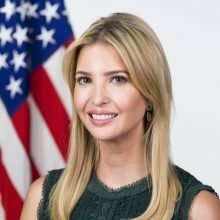 Prior to her father’s election as forty-fifth President of the United States, Ivanka oversaw development and acquisitions at the Trump Organization alongside her brothers Donald Jr. and Eric. Ivanka led some of the company’s largest and most complex transactions. Also an entrepreneur, Ivanka founded an eponymous lifestyle brand.